The XM80 has long been the standard by which the US military has measured performance across all 7.62x51mm bolt action sniper rifles. With the introduction of the Federal 149gr 7.62x51mm Full Metal Jacket, you can now experience that same level of performance for yourself. 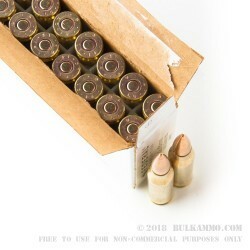 The Federal 149gr 7.62x51mm FMJ utilizes a solid steel core to increase the both the sectional density, and inherent penetration characteristics of the 7.62x51mm round. A magnetic copper plated full metal jacket helps to create a smooth and streamlined super sonic profile around the bullet in flight, and protects the steel core as it transcends down the barrel during ignition of the primer. 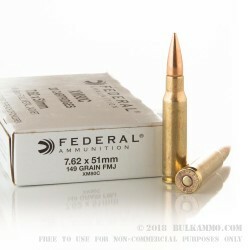 At an average muzzle velocity of 2,835 feet per second, the Federal 149gr 7.62x51mm FMJ is capable of supersonic flight out to nearly 500 yards, and will perforate intermediary obstacles such as stucco, drywall, and cinder blocks with minimal deformation. 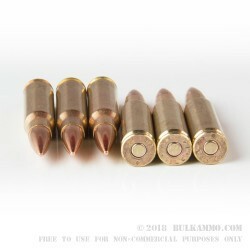 Competition shooters looking for a high performance round that exceeds the very standards of our own US military will be well armed with the Federal 149gr 7.62x51mm FMJ. Q: Are these new brass? Why is there discoloration on the neck? 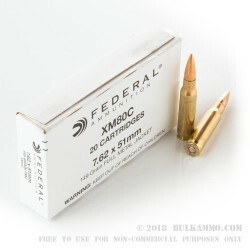 A: This Federal XM80C ammo uses new brass. The discoloration is annealing, which is a heat treatment process for brass that makes it less brittle. This is required for all military ammo.